MIAMI BEACH, Fla. - Miami Beach robbery detectives are asking for the community's help in identifying a third person involved in a recent armed home invasion. The robbery was reported just after 7:30 p.m. Oct. 24 in the 900 block of Pennsylvania Avenue. According to an arrest report, the victim entered his home with an acquaintance, identified as Edward Perez, 19, who was later determined to be one of the robbers. Once inside the apartment, Perez told the victim he needed to go outside for a moment, at which time he opened the door for his father, Eduardo Perez, 43, and another unknown robber, authorities said. Police said the two men pointed a gun at the victim and the victim began to fight with the robbers. According to an arrest report, Eduardo Perez struck the victim multiple times in the back of the head while the unknown robber ordered him to "give me everything you got." Police said Eduardo Perez continued fighting with the victim on the floor, at which time the unknown robber tried to put handcuffs on the victim. The victim was able to fight off the man from putting the handcuffs on him, but the man then tried to choke the victim with a leather belt as the victim tried to leave through the front door, authorities said. According to the arrest report, Eduardo Perez stole the victim's safe, which contained $2,000 in cash and some prescription medication, from his bedroom closet. 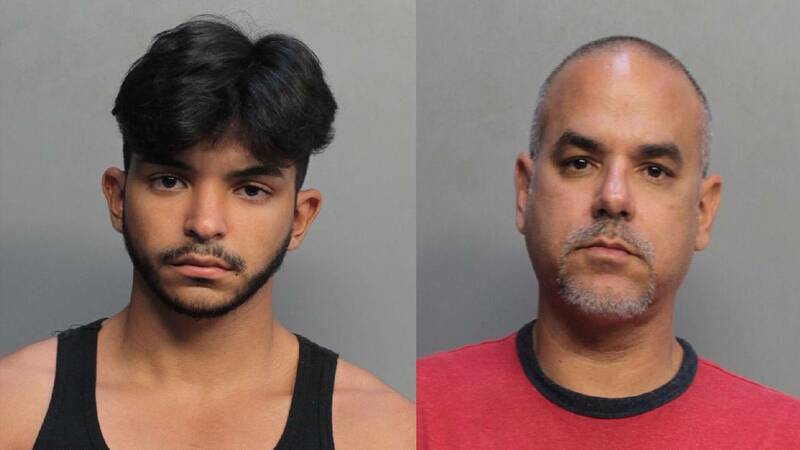 Authorities said Eduardo Perez and his son were arrested Tuesday at their home in the 1800 block of Northwest 74th Street. Police said Eduardo Perez was found sitting on a couch outside the home and tried to hide a gun under the sofa as officers approached him. He spontaneously told the officers the gun belonged to him and that he uses it for protection, the arrest report stated. Eduardo Perez does not have a concealed weapons permit, authorities said. Police said he and his son confessed to robbing the victim and stealing the safe, which was found in Eduardo Perez's bedroom closet. Police said Eduardo Perez admitted to using a hammer to open the safe. He and his son were arrested on charges of home invasion robbery with a firearm. Eduardo Perez faces an additional charge of carrying a concealed weapon. Edward Perez faces an additional charge of possession of cannabis. Miami Beach police spokesman Ernesto Rodriguez said detectives are still searching for the third robber, described as a Hispanic man, who is about 6 feet tall, weighs 200 pounds and is between the ages of 40 and 50. Anyone with information about his identity is asked to call Miami-Dade Crime Stoppers at 305-471-8477.